You know how it feels when nothing seems to go right. You feel it in your gut, and it’s just one thing on top of another. It feels like the world is against you, and nothing can change. You’re having a bad day – and here’s why it’s okay. The world works in mysterious ways. Sometimes you’re up. Sometimes you’re down. It’s a roller coaster, and you’re along for the ride. You can choose which roller coaster to get on to and which one to get off of, but you can’t control other people’s moods, relationships, choices, etc… They’re along for the ride, as you are. You can’t let it get the best of you. You can be aware of the poor day you’re having, and stop. I usually like going for a walk. You can shut your door and work on admin tasks instead of having to interact with other people. You’re bad day won’t last forever, and tomorrow is an opportunity to start over again. As long as you’re aware that this particular day has gone awry – you can act and change your direction, and attitude. I was a firm believer of the concept – NO BAD DAYS – however this is unattainable. When doctors or firefighters have a ‘bad day’ people die. Good thing ‘bad days’ are few and far between. When you have a ‘bad day’ your business might fail or a strong employee might quit. It happens. 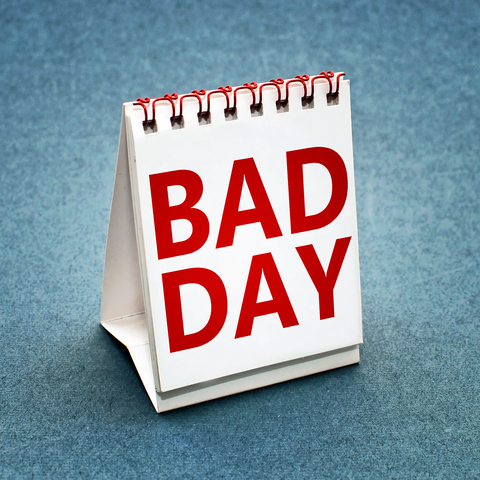 Bad days can be tackled by flipping your psychology. Be aware. Don’t let emotions get the better of you. Be in control of your attitude. If you need to cry, if you need to let out your anger – do it. Close the office door, go for a walk, hit a punching bag. Control it and own it, but don’t let it own you for days on end. Tomorrow is a great day to start over. Look at it this way – using the roller coaster analogy – you must go down before you can go up. Know with the bad days there will be a much larger portion of good days. In essence – a bad day means you’re that much closer to having an awesome day. View your bad day as an opportunity to start over. Understand why you’re feeling this way, and think of ways to prevent this feeling in the future. This is why I like going for walks. Almost within a couple hours or so of my day getting started I get a feeling on whether or not it’s going to be a good or bad day. A colleague of mine would lock himself in his room, turn off his phone, and start over. He would run over why he does what he does, he would read positive reviews of his services, he would go over his scripts, and presentation time-and-time again. This day might have been a poor day for him, but he’s going to ensure tomorrow is a great day. He viewed it as an opportunity to get better. You can do the same. Just as you’re self-aware of whether or not it’s going to be a good day or bad day – ensure you roll with the good. Momentum is one heck of a thing. Just as a bad day can ruin you for days or even lead to depression, anxiety, alcoholism, and the list of vices goes on. A good day can lead to endless positive momentum. Yes, there’s going to be a bad day thrown in there, but you need to be aware of when to ride the good wave. You can visualize your day and how it’s going to go positively. You can do this as soon as you wake up. Grab a glass of water, and sit and think. Don’t check your phone just sit and engage in thought. Think of how good this day is going to be, and visualize what’s going to happen. This can be a powerful process. Just as you can get lost in the bad, you can also get lost in the good. When you’re feeling good, and you know it’s going to be a good day…roll with it. Make the calls you’ve been afraid to make, reach out to those who you haven’t spoken with in awhile and you’ve been meaning to reach out. Do the challenging things you’ve been putting off, and you might find they work out well for you. You don’t own the roller coaster of the ups-and-downs; good and bad. You’re strapped in and you must be aware of this. Ensure you accept the bad days, and roll with the good. You’ll be amazed at how many good days there are…and how few bad days. This entry was posted in Marketing, Sales, Self Development, Service, Small business and tagged bad day, branding, Business, Calgary, differentiation, good day, Guy with Bow Tie Marketing, Jordan Rycroft, Jordan The Guy with the Bow Tie Rycroft, marketing, marketing blog, personal brand, psychology, self development, small business by Guy With Bow Tie. Bookmark the permalink.